View More In Covering Plastic. This greenhouse clear plastic is as good as it gets! Tough polyethylene unfolds easily, quickly and stands up to 4 years. Some growers have gotten up to 8 years out of their greenhouse film. Consider cleaning your film with soap and water to increase the life of the film. The thin yet durable polyethylene resin allows optimum light transmission for optimum plant growth. The infra-red additive helps to maintain a more stable greenhouse environment and reduces heat loss. The use of this product on a PVC frame will void the warranty if you do not use a primer on the pipe. If you order greenhouse film during peak season expect shipping to take up to 14 business days to ship. Be sure to allow yourself plenty of overlapping for a sure fit. 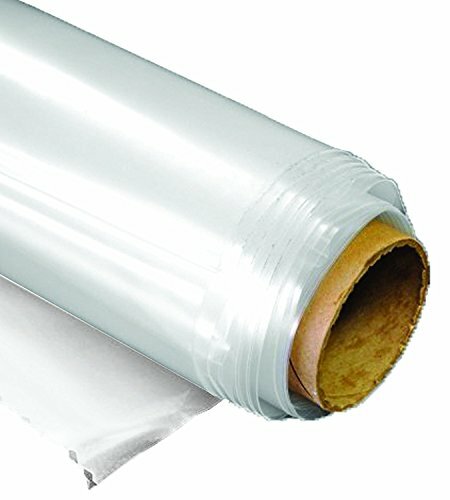 One roll of clear plastic Greenhouse Film 16ft. x 25ft. Higher Light Transmission for optimum plant growth. If you have any questions about this product by Sunview, contact us by completing and submitting the form below. If you are looking for a specif part number, please include it with your message.